When we stop in to see our repair technician, we usually see the whole range of Powell models -- Signature, Conservatory, Custom. However, Powell Sonaré flutes rarely come in to the shop here. Why is this? 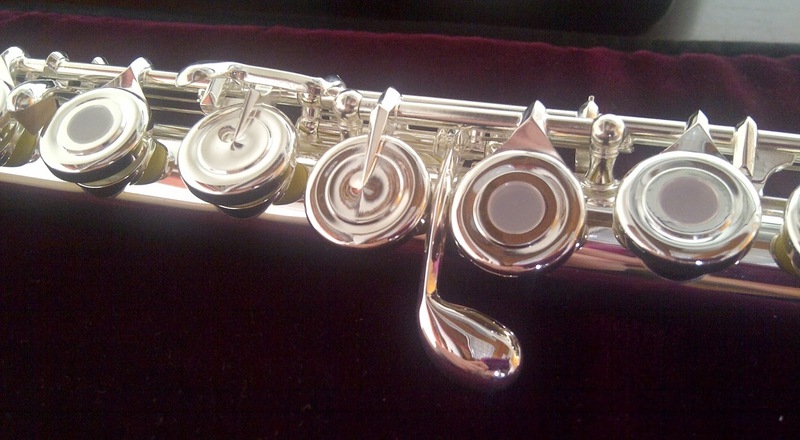 Well, Powell Sonaré flutes are mostly serviced by repair technicians at the dealer location where the customer purchased the flute or by other local repair technicians in the customer's area. There are numerous dealers across the country who sell and service Powell Sonaré flutes and many independent technicians. For Powell models, there are fewer dealers in comparison. Each Powell dealer must have a Straubinger-certified repair technician since Powell models use Straubinger pads. Since there may not be a Powell dealer close to every customer, or Starubinger-certified independent technician, many customers send their flutes directly to Powell for repair. Although Powell's repair tech, Rachel Baker, doesn't see many Powell Sonaré flutes on a regular basis, we were still curious about differences in repair between Powell and Powell Sonaré models. She told us that essentially, the repairs she does are pretty much the same -- replacing pads and adjusting the mechanism. These are the essentials which she does on all flutes. The only difference, she tells us, is time. She says that the time it takes to repair a Powell Sonaré is less than it would take on a Powell. Why is this? Well, there are a couple of differences. The Powell Sonaré models have felt pads and a different mechanism. Specifically, the tolerances on the Powell Sonaré and Powell models are different, and this is what accounts for the difference in repair time. You may notice tolerance levels in the "feel" of the mechanism. Since Powell Sonaré flutes are designed for younger players, the tolerance levels do not need to be as high as they would on the Powell models. Mechanisms with very high tolerance levels will take much longer to adjust. You will find a complete list of Powell and Powell Sonaré dealers on the Powell website at https://powellflutes.com/dealer. Powell repairs may be scheduled directly through the website at https://powellflutes.com/repair-doctor/schedule?destination=repair-doctor/schedule/repair.